The SD10 is a miniature micromanipulator that is ideal for positioning applications that require micron level resolution. DT100 series stages use a precision rolled 80TPI lead screw for smooth positioning along their entire travel. Our miniature dovetail slide uses an adjustable spring loaded gib design. This feature ensures stability, straightness of travel and also works as a locking mechanism. The device is equipped with a fourth axis which can be set at any angle thru 360° of motion. The compact size of the SD10 makes it ideal for stimulator applications. The mounting method makes removal and replacement very straight forward. 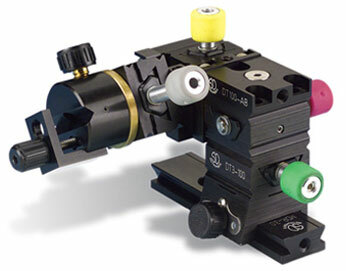 The addition of a simple stop allows repeatable placement.